The ex-wife of England and Arsenal star Ray Parlour has won her legal fight for maintenance amounting to more than a third of his future income. Karen Parlour was told by the Court of Appeal her award of £250,000 a year personal maintenance would go up to £406,500 and be reviewed in four years. She said she was "very relieved at the outcome of the appeal". Ms Parlour's lawyer had argued she rescued his career and was entitled to more of his £1.2m-a-year income. The former optician's assistant, from Romford, Essex, had claimed the earning capacity Parlour had built up was a "matrimonial resource". The judgement recognised the 31-year-old footballer's income would "plummet" in his mid-30s and his ex-wife would need to save an estimated £294,000 a year from her initial maintenance. Christine Barker, head of the matrimonial department at law firm Laytons, told BBC News Online the judgement would be consigned to "a very limited number of cases". She said: "I don't think Joe Public particularly needs to worry about it. "The principle seems to apply to those couples with a huge earning capacity where there is a surplus of money over and above what they both reasonably need. "The fact the award will be reviewed after four years shows the court expects her to set up a business or become self-sufficient in some way. "It seems to be working towards a cut-off point, which I think is probably right." Lord Justice Thorpe said it was wrong in principle for the earner to control the accumulated wealth but the other party must invest the award sensibly. In the initial settlement, Ms Parlour was given two mortgage-free houses worth more than £1m and a £250,000 lump sum. Joshua Rozenberg, legal editor of the Daily Telegraph, told BBC News the judgement specifically applies to wealthy couples who have "very little capital" but "a great deal of earnings". Maintenance payments over a few years, by one partner who has substantial earnings, is a means of ensuring that both parties could "go their own way" and make a "clean break", he said. The onus will be on Ms Parlour to save and invest wisely to ensure her future independence, he added. She also receives the £12,500 sum Mr Parlour pays annually for each of the children, aged eight, six and four. In January, High Court Family Division judge Mr Justice Bennett increased Mrs Parlour's annual maintenance to £250,000 from her ex-husband's initial offer of £120,000. 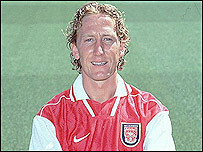 If Ray Parlour gets divorced 3 times, will he lose all his future earnings? He ruled that the offer had not reflected the major part she had played in persuading Parlour to "grow up" and drop the hard-drinking "laddish" culture that existed among certain Arsenal players. Ray Parlour's team had countered with the argument that it was not Mrs Parlour who "performs the labour", or who "submits to Arsene Wenger's regime of behaviour and abstinence." Should divorcees be entitled to future earnings?